In editing or proofreading of theses or dissertations, we follow the guidelines of the Editors’ Association of Canada (EAC). For example, the editing will not affect the content or structure of a student’s thesis. Your work will remain your own, only more polished. Our edit will make corrections of grammar, idiom, punctuation, spelling, and mechanics. 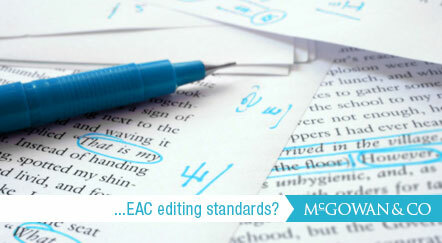 Following the EAC standards for editing, we will query your writing and suggest changes where an alteration is indicated. No new content will be introduced. Written permission for professional editing from your thesis or dissertation supervisor is required, specifying what the editor is allowed to do. We will provide you with a simple explanation of various types of editing and the EAC standard agreement form for your supervisor to complete. As the fee charged depends on the type and level of editing required, a sample edit will be provided.